Courtney Butler is the Director/Owner of Balance Yoga and Wellness, Yoga Studio and Registered Yoga School. Courtney started practicing yoga as a young girl with Lilias Folan on P.B.S.in the 1970's. She was actively involved in modern dance and ballet as a child and teenager. In 1989 at the age of nineteen Courtney worked for Aveda Beauty Products. There she began her first formal yoga classes. She continued to practice at home at least three times a week for the next ten years. During this time she had three boys and finished three degrees in the field of Early Childhood Education. She started taking yoga classes with a local yoga teacher and delved deep into the study of yoga at home. In 1999 she decided she would like to share her love of yoga with others. She had been teaching her fellow classmates yoga techniques while in college. As a result she was asked by the college if she would like to offer a Continuing Education Yoga Course. On Sept. 13, 2001 she taught her first yoga class with four students. Her classes began to grow and she realized the need for some sort of formal training. 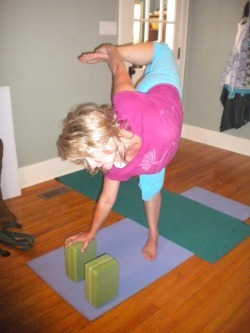 In 2003 she settled on a Registered Yoga School, Turquoise Tree Yoga in Benton,Arkansas. She trained with Robin Johnson 500hr E.R.Y.T. (who studied under Erich Shiffman) . She received her status at a Registered Yoga Teacher at the 200hr level with Yoga Alliance Jan 2004. In 2008 with nearly 2500hrs of teaching under her belt she took a five month break from teaching to reflect and seek guidance on her future. After deep reflection she came to the realization that she had begun to teach yoga to share her love of yoga with others, now she was ready to share her love of teaching yoga with others. In 2008 she received her E.R.Y.T. 200 (Experienced Registered Yoga Teacher with 200 hrs of education and a minimum of 1000+ hr.s teaching). She went back to teaching at NPCC (Community College) and the YMCA. On Nov. 4th 2008 she received the call that she had been approved to open a Registered Yoga School as an affiliate of Turquoise Tree Yoga. March 2009 she started the first training. On Jan.18th Courtney has joyfully graduated twenty four students since the inception of the school. In 2010 she became a Registered Pre/Postnatal teacher, as well as a Registered Children's teacher, and a member of the International Association of Yoga therapy. She is currently working on her 500 hr training with Robin Johnson of Turquoise Tree and Elana Johnson of Yoga Mommy. Courtney has over 5000hrs in the classroom teaching yoga and yogic philosophy as well as pranayama and meditation. Courtney has trained with Desiree Rumbaugh, Judith Lasiter, Sean Tebor, Karl Straub, Carol Kranowitz, Andrea Fournet, Lawrence Biscontini, Sarah Powers, and many other wonderful yoga instructors and meditation teachers. Courtney's greatest influences and her style comes from her teachers Robin Johnson and Elana Johnson as well as Erich Shiffman, Rodney Yee, and Lilias Folan. She teachers what she describes as "Therapeutic Eclectic Hatha Yoga." She offers teacher training, workshops, retreats, yoga events, public and private classes of a therapeutic nature. All of Courtney's workshops can be used for Continuing Education Credits for Registered Yoga Teachers.